Yumi, I love this little old lady so much. The past few months I feel like finally, Yumi is truly settled into her new life. 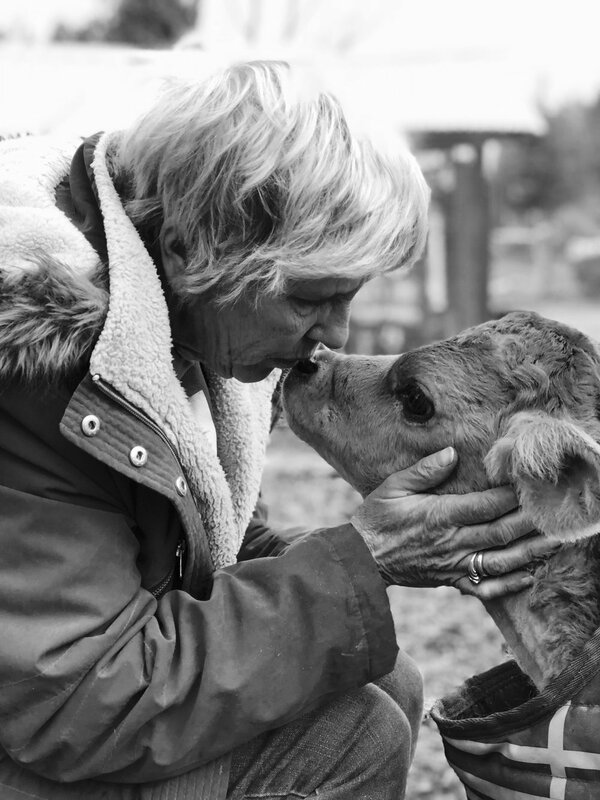 This past spring one of the dairies we get baby boys from asked if we could provide retirement homes for a dozen of their older girls needing retirement. I immediately asked if Yumi was in the group. A few years ago while there to pick up babies, I spotted this adorable little cream Lamancha with a beautiful beard and a head full of curly top hair amongst the dozens and dozens of other goats. I instantly loved her. 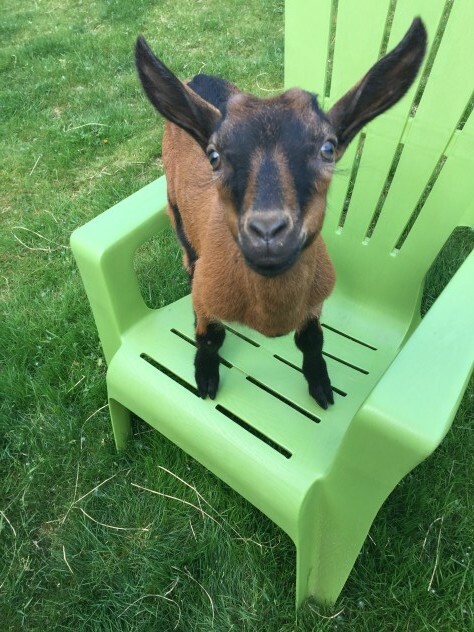 Conversations led me to realize we were bottle raising her babies from that year at Baby Goat Central. Bruno & Gus. Bruno was the spitting image of his mom. I texted my good friend and volunteer Amber “I just met B& G’s mom, I love her. We need her!” Fast forward 2 years later and we have her and she’s one of the most wonderful goats I have had the privilege of caring for. Yumi, as with all of our other Golden Girls, was a dairy girl for over a decade. Leaving that life was a huge change for the girls to say the least. They have all adjusted in their own way and in their own time. Yumi seemed to make the transition seamlessly. She is a typical Lamancha doe, strong and bossy. But who she is today versus who she was when she arrived, she is a much different goat. She is settled into her life of leisure that she gets to share with the twins she gave birth to less than a week after she arrived. To watch her evolve as a mom, from an over protective, obsessive mother to letting her kids gain their independence and strong personalities, it’s been amazing. She is comfortable in that her babies are hers, forever. She has become my quiet companion every morning. She follows me around, always the observer and never misses an opportunity to give me leg massages with her curly hair topped head. She has become very affectionate, I feel it’s a sign of the trust that I’ve earned. She has always trusted me in a way, she sort of had to. She was in a new place after over a decade, she was raising babies for the first time and I was always around, whether she liked it or not. But this trust, this trust is different. Today, she is truly settled and her personality shows it. Since welcoming the Golden Girls we have had to say goodbye to a few of these lovely ladies, Ysadora, Velvet, Virtue and Ynez all spent the last few months of their lives pampered in their retirement. Wish and May reside with board member Bonnie and May welcomed a sweet baby girl a few weeks after her arrival with us. May is truly having the time of her life being able to raise her baby girl. Yakina has a forever home with adopter Hannah and her herd of PSGR grads. 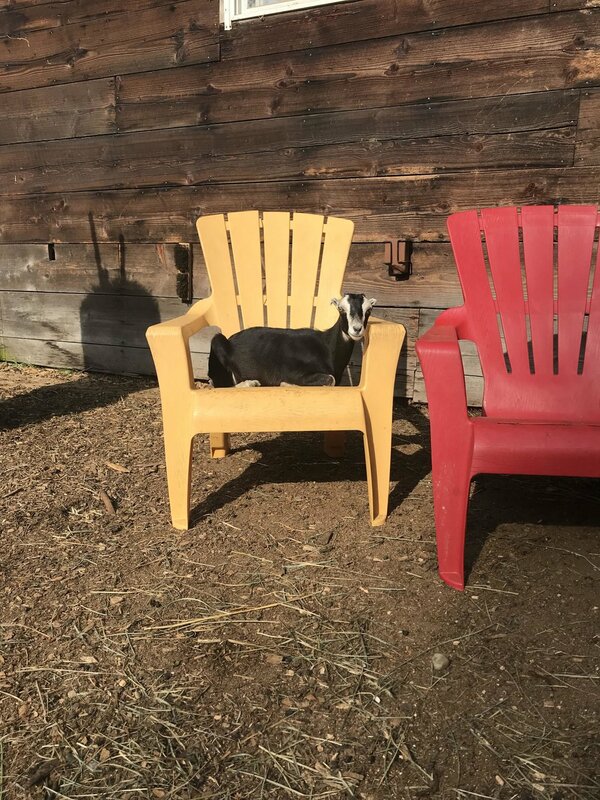 Jubilee, Lady and Victory have an amazing retirement home with foster mom Debbie while Yumi and her kids along with not so “golden” girl Ruby reside here with me at Baby Goat Central. Last week I watched Yumi run and frolic with her kids. Like she was a decade younger than she actually is. I couldn’t help but laugh out loud as my heart was so full watching her play. No matter how long they are each with us, they are so very loved. They deserve all the love and pampering in the world. We are so happy to be able to give them this life, a life I think my favorite old lady Yumi would say, is quite beautiful. Part of my morning and evening chores routine, every day, now includes milking a goat. Milking twice a day, by hand, in the pasture. Something I never saw myself doing. Never say never, I should know this well by now. A few years ago I taught myself to milk with one of the first goats to come to BGC. Since then I had only tried my hand at it again a few times when the babies born at BGC this spring couldn't keep up with their former dairy mama's milk production. Now, it's second nature and another thing added to the seemingly never ending daily to do list. I certainly don't need anything else added to the daily to do list but there isn't anything I wouldn't do for Ruby. There are some goats that instantly grab a hold of me. Jitterbug, Evangeline, Renata, they are perfect examples of goats who instantly made their mark on my heart, and now, there's Ruby. 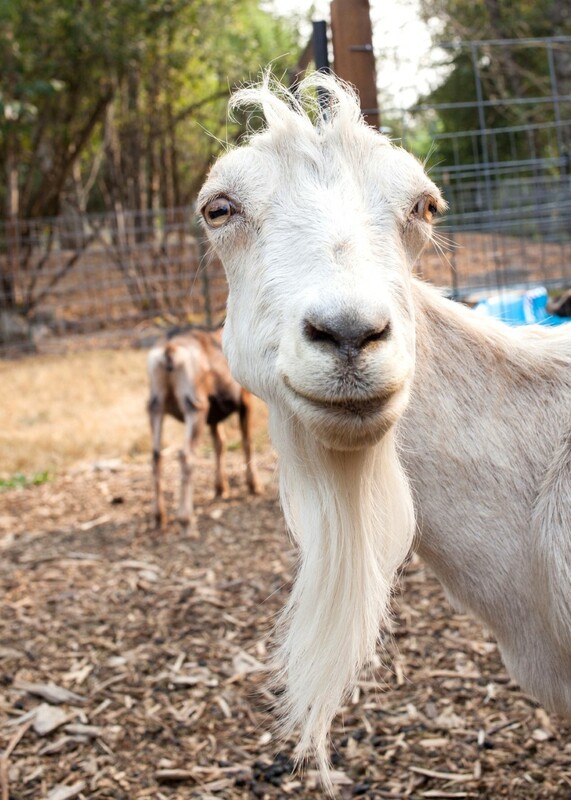 There are some goats that come into the rescue that need us in a different way. Yes, they all depend on us for their daily care and love but there are some that need more. More comfort, more focus, more care. The girls before Ruby that had that same hold on me, they all needed me more, just as Ruby does. Ruby was a part of our Golden Girls rescue although technically, Ruby isn't quite in her golden years just yet. Ruby is 6 years old and this year she had to have a C section to deliver her big, giant baby. When I first met Ruby she was just a few weeks post-op and not in the best shape. Her surgery scar was still very apparent but she was thin, oh so thin, her coat was rough and she walked oddly. Her body had clearly suffered some trauma and although she could get around just fine, something clearly wasn't right. The dairy knew she shouldn't be bred again so asked if we would take her along with the Golden Girls. When I went to meet the Golden Girls I was greeted at the gate by Ruby and she never left my side, looking at me with those sweet, sweet eyes and that trademark Ober head tilt. In that moment I knew, we were taking her and she had to come to BGC. Her trust in me was immediate and her affection was, and still is, over the top. Not only is she like a puppy following my every step and wanting snuggles, she loves to lick me. Especially on my face and especially when I'm milking her. I wasn't planning on having to milk her, in fact, I didn't know the dairy still was until she had been home a few days and wouldn't stop crying. She wanted to be milked and no wonder, her udder was huge. And so it began. Yes, I could let her dry up but that process wouldn't be easy given what we're feeding her to help her gain the weight she so desperately needs and not to mention, we need the milk. Between our 2 farms we are feeding 4-5 gallons of raw goats milk to our bottle babies everyday so why not milk her? And why do I milk her in the pasture where Yumi's babies use me and Ruby as a jungle gym, yank mouthfuls of hair out of my ponytail and try and steal sips from Ruby non-stop during the process? Well, getting into the stanchion is a struggle for her due to what Dr. P believes is a spinal injury. Dr. P was out not long after Ruby arrived so I asked him to take a look at her. He had me walk her in the pasture so he could watch her. She often drags her back feet along, Dr P noted that she didn't lift her back legs past her hip joint. He felt her muscles and pointed out how muscular she was in her front versus her back. What does it all mean? She likely sustained a spinal injury during kidding the year before. That forces her to lean forward, carrying more weight than normal in her front and her inability to fully move her back legs properly. That also explains why she had to have a C section this year and is unable to continue to safely be bred. Thankfully, her pregnancy test came back negative, we tested her too, just to be sure. Ruby is on medication to help ease any pain or discomfort the injury causes her, she's likely been living with it for over a year. She gets around well though, she has even started standing on the gate to cry for me if I'm 5 minutes late to feed her grain or if I've switched up the routine of when I now let Yumi's kids out for a playdate with the bottle kids so I can milk Ruby in peace. She is still quite needy but even on the longest, hardest days, the days where I just simply can't get it all done before 9pm and still leave things unattended to, even on those days, I don't mind. I always make time to not only milk her but to sit with her and give her cheek scratches, let her lick my face and have sweet conversations with me. What I wouldn't give to know what she's saying. She has affectionately become known as "Aunt Ruby" as Yumi's kids absolutely adore her. Keiko & YoYo climb on her, go out grazing with her, eat with her, it's really quite sweet. The bottle babies have taken to her as well when she spends time with them, she can get them access to branches they can't get on their own. She is so patient and kind with them, it makes my heart hurt that she didn't get a baby of her own to keep....but those days are thankfully in her past. We can never erase their past. Sometimes, no matter what we do, no matter how much money we are willing to spend, no matter the time, energy and heart we're willing to commit, it isn't always enough to make it better. Luckily for Ruby, her injury is one she can live a long, healthy life with and she is now somewhere that her health will never be at risk for a baby or for milk. This rescue life has made me many things, a milkmaid was certainly unexpected but every time I milk Ruby and she turns around to lick my face while I do, I am reminded that some of the best things are the unexpected things. I remember the day Renata & her babies arrived like it was yesterday. 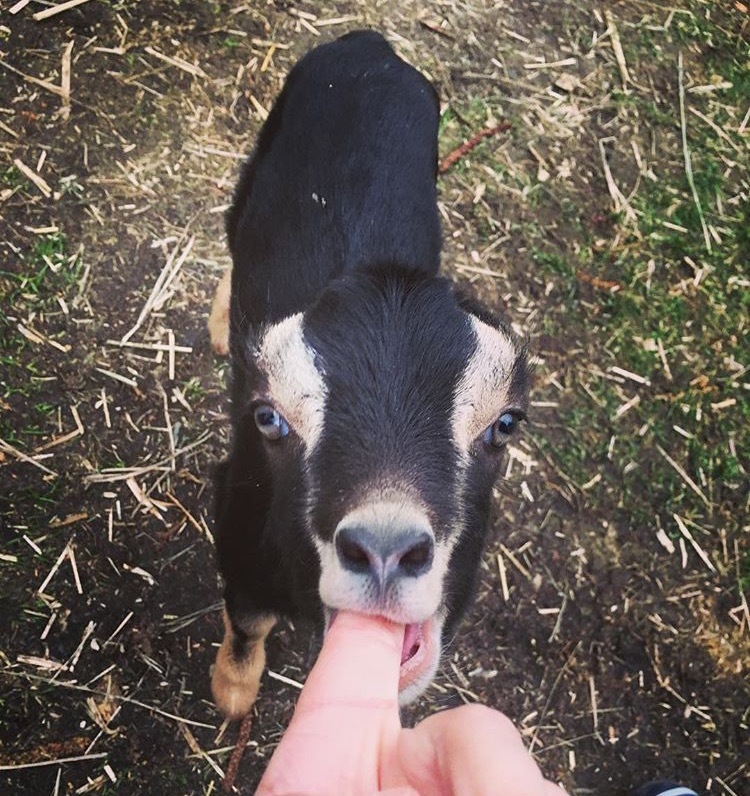 It was the end of summer, both our farms packed with the kids of the busiest rescued baby season we have ever had, goats returning from foster, a recent slaughterhouse rescue and lots of goats via urgent owner surrender. But when I got the message from a dairy "interested in a mom and her 1 week old boys? She has a dropped udder" I had that all too familiar feeling, she belonged with us. We asked one of our amazing foster homes if they could take them in, they agreed and we made arrangements to pick Mama & babies up the next day. We knew that without us, the chances of Mama and her babies ending up in the hands of a meat buyer was high. That morning they told me one of the babies was recovering from FKS (floppy kid syndrome) but that he was improving. I had a feeling that it was likely they would need to come to one of the rescue's farms so we could monitor and treat (if need be) the FKS. 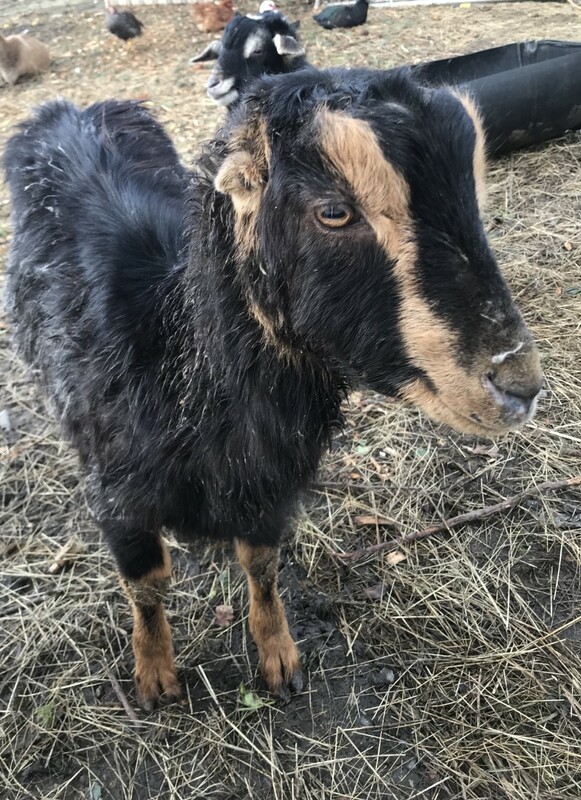 Barbara called once she picked up the family and not only did Mama goat have a dropped udder, she was in rough shape with an infected abscess on a foot. So to BGC she was coming. I immediately shuffled goats and had a shelter and pasture ready for mama & her babies when they arrived. I opened the truck and my heart swelled while tears filled my eyes, poor mama was a mess but immediately, I loved her. She talked, sniffed my face and nuzzled her babies. Her udder was literally dragging on the ground. Covered in manure and muck, it broke my heart. She was unsure of what was happening, but she trusted me as I led her to her new pasture with her babies happily bouncing behind her. That was the beginning of a special bond between Renata & I.
I spent hours that day in her pasture letting her get used to me and her new surroundings. I snuggled her babies who were as friendly as bottle raised babies and watched them jump and spin and run freely in a big open space for the first time. Renata would often come over and sniff my face, talk to me and let me pet her. She struggled to walk. Her foot clearly bothering her and her dropped and very full udder causing her to have to kick one leg out and around when she walked. Laying down was hard for her as she had to constantly reposition her udder so she could get comfortable. Her babies had no problem nursing though and sweet little Duncan, thankfully, had no lingering FKS symptoms. In the weeks that followed Renata had multiple visits with our vet Dr. P. He removed, as best he could, the infected growth on her foot. We discussed an udder removal once the boys were of weaning age and what that would entail. Renata started to gain weight, get a shiny healthy coat and truly embrace her new lease on life. She had big open spaces to roam, a stall all her own for her and her babies at night with a kiddie pool full of dry soft bedding to sleep in which quickly became a family favorite spot. She received supplemental feeding which at first was an acquired taste which is hard to believe now and she begs for and scarfs down her grain and pellets everyday. Over time, her udder has shrunk considerably and we no longer are having to consider an udder removal. She had been getting around great until about a week ago when she started favoring her once infected foot again. Earlier this week, Dr. P came to see her. Unfortunately the infected area is growing back slowly. Sometimes no matter how much is taken out, we just can't get it all but cutting away at it. The infection isn't spreading, it is localized in a toe. What this means is that we will have to amputate her toe. A procedure we are not new to. 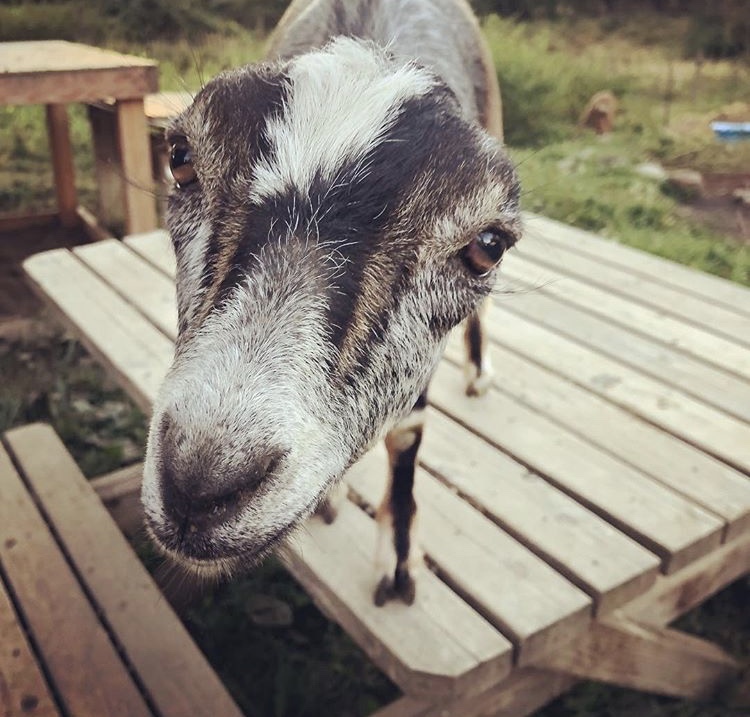 A few years back we rescued an older goat from a slaughterhouse, Faye, who had a similar foot infection due to standing in mud, muck and unsanitary conditions and Dr. P performed the same surgery. What this means for Renata is a few weeks bandaged and needing dry ground to stand on which in the PNW is near impossible to come by unless we keep her in a stall of the barn. We're currently working through the logistics of it all but we will work with Dr. P to plan the best time to proceed in the coming weeks. The amputation won't impact her mobility once she has healed but it will ensure she remains infection and pain free. I was saddened by the news. Not because it will impact Renata negatively but because there is still more that needs to be done along her journey to get her to where we want her to be. Despite still needing another surgery, she has come so far. I can't forget that. Her transformation the past few months has been amazing and inspiring. I struggle to put into words my love and adoration for Renata and the bond her and I share. I look at her and can't help but smile. She is so happy in her new life and that, that makes me so unbelievably happy. There is something so endearing about her. About her story. At first glance, her physical "imperfections" are apparent; her dropped udder, her square face with bottom teeth that often stick out, her unicorn horn scur, the bad feet that she will forever have to live with to some degree. But to me, she is absolutely perfect. She is an amazing mother, she adores her boys and they adore her. At 5 months old and already 1/2 her size, she is still nursing them. The 3 still nap and sleep in a small kiddie pool together all snuggled up. For the first time in her life, she gets to keep her babies, it is apparent she is relishing in it, not something we often see from former dairy goats. She loves being a mother and all that entails. She has integrated well into the big herd here at BGC and can even be seen playing just like a kid from time to time. It is truly the best feeling to see her jump and frolic like her babies do. She loves her life. I love spoiling her and giving her that life she otherwise would have never had. Despite all she has been through, she is happy. Her road hasn't been an easy one and there are still more bumps ahead to navigate but all I want is for her to be happy. I'll take care of the rest. Happy baby Duke in the Christmas Day snow! I wondered how much plastic I would have to put down on my kitchen floor to bring Norman the calf into my house for the night? Making yet another trek to the barn to care for him at one a.m. on a bitter cold night, it wasn’t for Norman that I was toying with this idea, it was for me. 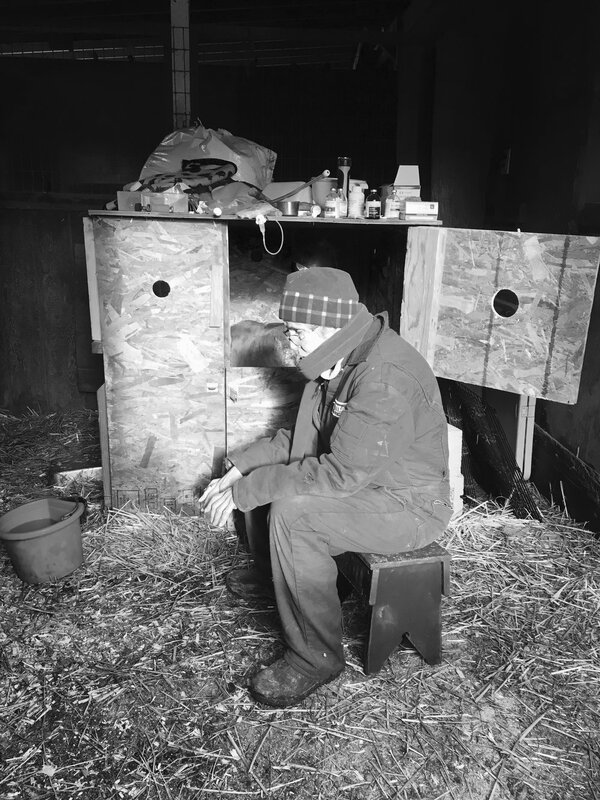 Norman was warm and tucked into a bedded “hot box” in a stall but on day three of round the clock care, I was fast approaching the all too common “Rescue The Rescuer” status. Three days of little sleep, no shower, unbrushed hair stuffed into a stocking cap and thermal overalls thrown over pajamas—I was not a pretty site. After seeing how weak he was, I realized making the journey from stall to house would be asking too much of him. So Norman stayed put and I continued the back and forth from house to barn and back again every two to three hours. The “auction calf vortex” is powerful and depleting. I quit rescuing calves from auctions 15 years ago. The first time I naively bought two Jersey calves at auction for $5 each, I turned to the farmer sitting next to me and asked him what I needed to do for them when I got home. “Dig a hole’” he deadpanned. But he was right as one of the two died within a few days and the struggle to keep the other alive went on for several grueling weeks before he stabilized. I rescued more “auction” Jersey calves over the next few years and experienced the heartbreak of over 50% mortality. All the meds, vet intervention and love in the world cannot save them if they do not get good colostrum at birth. Even with colostrum, being taken from their mothers at a day old and hauled to a cootie-filled livestock auction doesn’t help either. The deck is stacked against them and their well-meaning rescuers from day one, especially the more fragile Jerseys. Norman sold for $10 at the livestock auction. As I was leaving, I saw the man who bought him re-selling him in the parking lot after the auction ended. To make an extra $10, he was reselling him to a livestock hauler for $20 who was going to load him into a stock trailer already filled with full grown cows and haul him to yet another auction the next day. All with the intent of making a little more money. Five dollars more? Maybe ten? Such a paltry sum for a precious life. It was sickening to watch the deal being made. With so many goats and sheep already at the rescue, warning bells were clanging in my head. But I bought him from the man anyway for $20 before the hauler got him. It is day 10 and with the “shot-out-of-a-cannon” feeling in full force, I find myself sitting on a stool in Norman’s stall at 2 a.m.—overwhelmed with frustration as his health plummets . Unable to stand, eat or even hold his head up—he is in dire condition. After the first four days of cuteness overload with Norman playful and active, it started on day five. A little diarrhea; then a fever. More diarrhea followed—more fever, then full on malaise, weakness and unwillingness to eat as little Norman struggled to fight off the inevitable viruses auction calves contract. Bitter cold and snow didn’t help. Multiple vet visits followed involving, catheters, antibiotics, fluids, and an endless mix of meds. He is a limp noodle and I struggle to hold his head up to tube feed milk into his bony body. The trek from house to barn and back continues nonstop with all the goats and sheep giving me the stink eye as I pass them by on my way to tend to Norman. Likewise the farm dogs who are peeved and also feeling neglected. Trying to unwind for a few hours in front of the TV is unfulfilling because I know Norman is outside feeling like crap. Day 13: The walk to Norman’s stall every morning now is a dreaded event. This morning is no different as I brace myself for what I might find. To lose them is soul crushing, especially after a protracted battle. There is always an element of disbelief that with all the meds and care, sometimes you still cannot save them. But there are wins too—so you keep trying. I swing open the stall door and a pair of big beautiful brown calf eyes are looking straight at me. His head is up! He is trying to stand! It is a “Eureka!” moment. I want to jump in the air and click my heels together with joy but am too tired. So I visualize myself doing it. As I write this on Day 16, Norman’s health continues to improve dramatically. He is drinking his bottle on his own again, and is up and roaming about. It is time for a hot shower and sleep for me and for Norman, a long, easy life.....go NORMAN! Never say never, it’s a lesson we’re taught early in life and it is one that could not ring more true than in rescue work. I had so many “nevers” in my head when we opened Baby Goat Central. Like many things, living rescue work 24/7 is something you simply cannot truly understand until you do it. 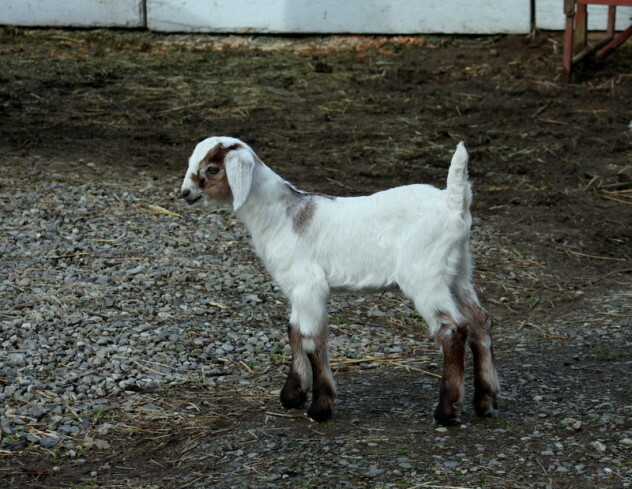 One of my nevers, I would never have baby goats in my house. I am a bit on the type A side, I like everything clean, organized and in its place. Farm life and type A personalities don’t go hand in hand, something I learned quickly and have adjusted to a little more slowly. A week after Nicky and Nitro moved in with me at BGC we rescued two newborn Oberhaslis and with temps below freezing overnight, I got them home and immediately asked Barbara, “they have to sleep in the house don’t they?” The answer was of course, yes. They lived in the kitchen overnight for a few weeks and once or twice slipped through the baby gate for some cuddle time on the couch. 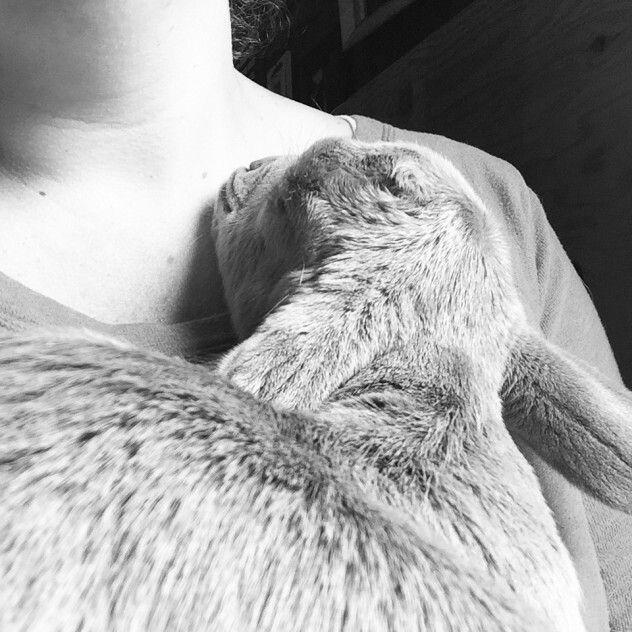 Last February, a few more spent a few nights in the kitchen and newborn baby Lamancha, Gobi, was curled up on my lap while I watched TV and had a glass of wine after the first big dairy rescue of last season. I thought that would be the extent of it. But again, never say never. In December, baby Charlie Brown moved in, full time house baby. A few weeks later, we had a friend for him, baby Rigby. 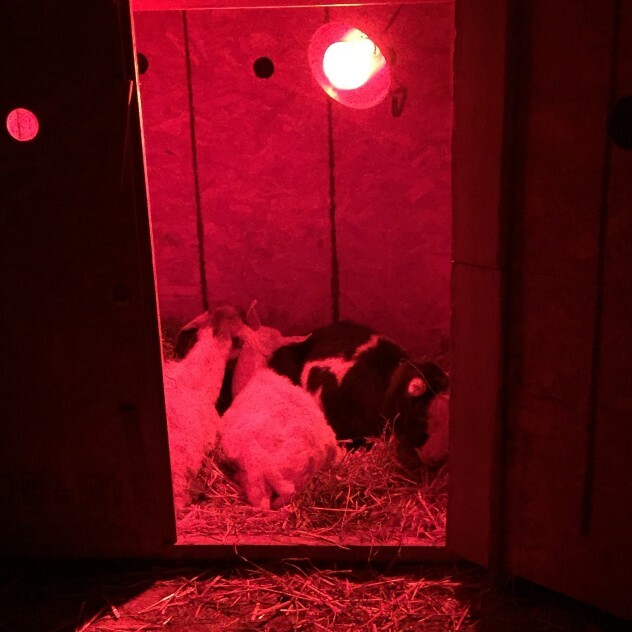 Temperatures were still too cold for babies in the barn at night. Last week, baby Lamanchas Bowie & Bennett arrived and well, it’s still cold. Very cold. So from about 6pm-7am every day, I have 4 baby goats living in my house. Charlie was an ideal house baby, he was quiet, calm and loved nothing more than to sleep curled up in my lap for hours. He slept in a playpen in my bedroom at night and never made a peep. Around the time Rigby arrived Charlie was more active and getting into more around the house. Everything had to be baby goat proofed. 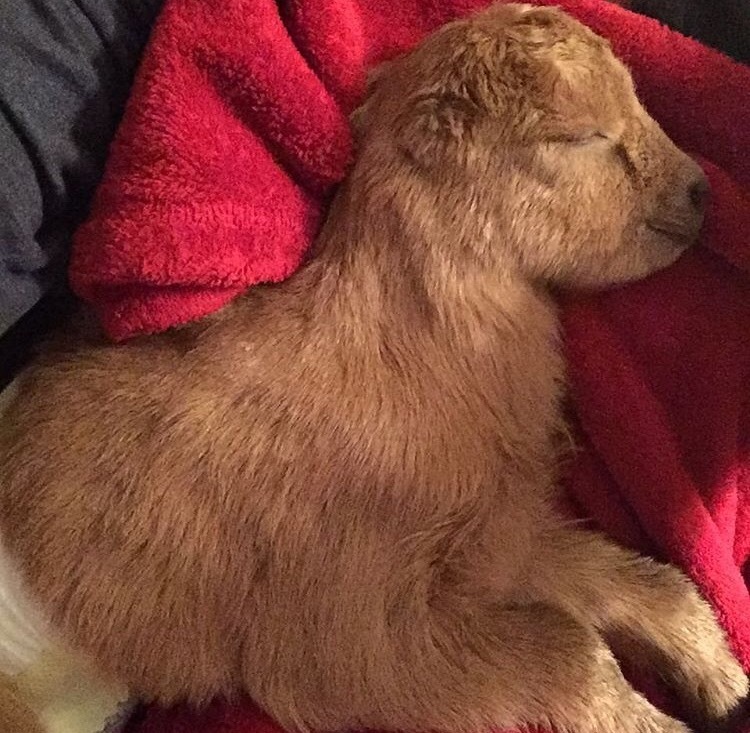 Having a baby goat in your house is a mix between the baby goat and a toddler and a puppy. They find every single little thing they can and in their mouth it goes. When Charlie learned to jump on my furniture, it was a game changer. My mom asked why I didn’t keep him confined to the kitchen or in a pen. Well, you answer that when you’re sitting there with an adorable little baby goat face staring at you and crying because they just want to be where you are. Charlie had the run of the house. When Rigby arrived I quickly started transitioning them to spending the daytime in the barn with time in their day pasture and Rigby loved it, Charlie, not so much. It’s been an adjustment for him but he is finally embracing it. At night I couldn’t all of a sudden confine Charlie who had spent weeks going where he pleased when I was home so Charlie and Rigby had run of the house. Night one Rigby learned how to climb on all the furniture. He was such a big baby that even the biggest diaper size barely fit. Lessons in preventing and managing diaper malfunctions were learned quickly. When the Lamanchas arrived last week we luckily had received all our goodies from the baby goat shower and we had these great soft indoor play pens. The baby Lamanchas were all set up in there but it didn’t take but more than a few hours before I let them out to play and my house had 4 crazy energetic, active and adorable babies running about. It’s not all fun and games, it’s a lot of cleaning and diaper changes and laundry. The evenings of hours curled up on the couch together are over, they are 4 busy babies who after turning the house upside down and mouthing everything they can, love to snuggle with each other, just as it should be. I will admit there are times I have just wanted to scream and then just simply cry. 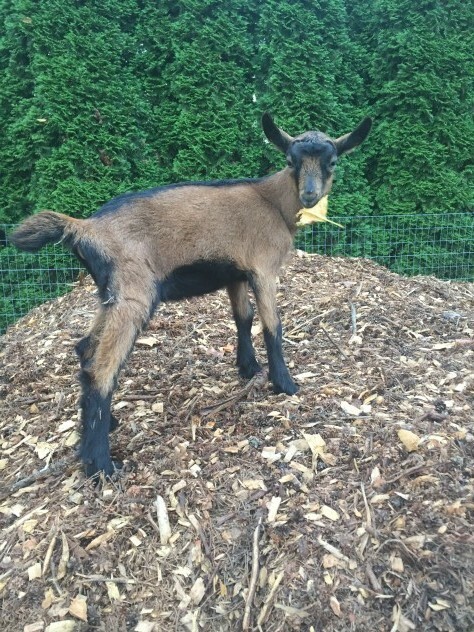 My house is often a disaster, I can’t do anything without baby goats underfoot and it sometimes just feels impossible to keep up on it all. But these sweet little babies, they can always ground you. They are the reminders of why we do all of this, why we let them take over our lives. They are safe with us. They are loved and cherished. 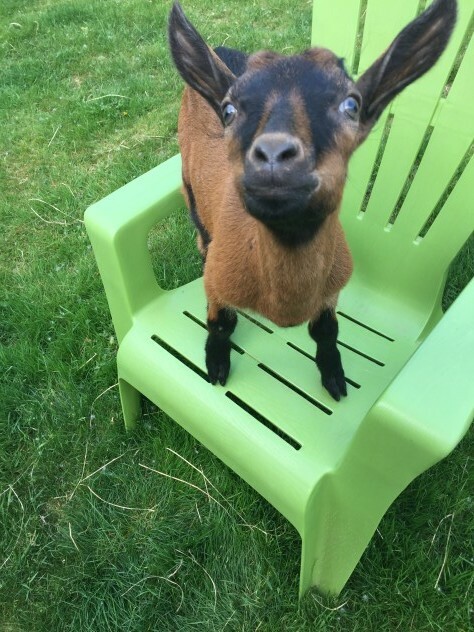 They get a chance at a life that so many baby goats don’t get. And if living in the house some until our weather finally warms up a bit, then so be it. It’s been over a month since Charlie first moved in and tonight, for the first time, I felt somewhat normal. After the volunteers left today all was in order outside and the babies were spending a rainy afternoon in their stalls in the barn so I went in the house, cranked up the music, lit some amazing candles made by lovely neighbor Devon and cleaned and baked and cooked and felt a little more like myself than I have in a while. The babies came in, had their bottles and went to bed, it was blissful. 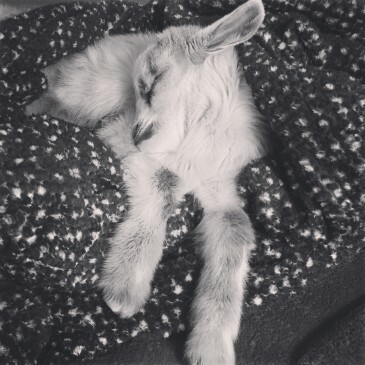 4 baby goats happy and sleeping warm and peaceful while I made dinner. The peace and quiet was short lived as all four were up and about an hour later and will likely be awake and busy until after all the lights are turned out for the night. This, this is my new normal. Smack in the middle of Neverland. I keep saying I can’t wait until they’re moved out and it will be nice to put my house back together but I will really miss them. It’s true, there is a magic that lives in Never Neverland.